Jenna Elizabeth Johnson: Ghalien Cover Reveal and Teaser Chapter! I hope you are all having a marvelous summer and that you are able to enjoy what's left of it. 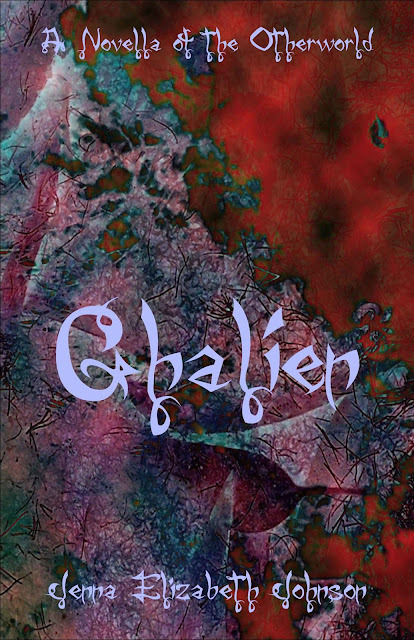 I know many of you are impatiently awaiting the release of Ghalien, the second novella told from Cade's point of view, and believe me, I'm just as eager as you are to be done with it. Well, I'm pleased to announce that the rough draft is complete and I'll be spending the next several days reading through it and making edits. Once I have it where I want it, I'll be sending it off to my editor and beta readers. I'm not promising any release dates yet because I'm not sure when it will be live. What I can give you, however, is the cover. A few months ago I posted two options here on my site and asked for you to tell me your favorite. And the cover that received the most votes was the red one! I don't have an exact count for you since so many of the votes were spread out over several weeks, but you seemed to like the red cover the most (and I must confess, I'm a bit partial to it myself ;)). Also, I am including the first chapter of Ghalien for you to read. Ghalien will be a little different than Ehriad in that it is composed of one longer short story and two extra scenes (I wanted to fit more scenes in, but it would have made the book far too long. I'll have to set those aside for another novella in the future). The first part, Ghalien, focuses on Cade's activities during the summer between Faelorehn and Dolmarehn. The two scenes that follow are shorter but they are some of the scenes my readers requested. The first one tells of the time Cade takes Meghan to the Otherworld to help her awaken her magic, and the second scene describes the events of the Beltane party at the end of Dolmarehn. As of right now, the entire book comes in around 64,000 words, which is only 6,000 words less than Faelorehn. Now, without further delay, I give you a sneak peek at Ghalien - A Novella of the Otherworld! I was dreaming of Meghan when the harsh wave of dark magic tore me from my much-needed sleep. The moment the shock of waking up to such a horror wore off, my anger grew hot and fierce. My dreams were never reminiscent of pleasant memories from the past, for most memories I dared to recall were anything but pleasant. But this one had been joyful and whatever unnatural faelah awaited me outside in the courtyard had ruined it. Often when I slept I didn't dream at all, or the dreams would reflect the darkness I spent my time shying away from. Simple, charcoal on paper landscapes that held no light or joy. Lately, however, my dreams had stretched and contorted themselves into nightmares, horrific scenes of my mother's monsters tearing people to pieces. No, not people, only one person: Meghan Elam. Groaning, I scrubbed my eyes with the heels of my hands and tried to shake the horrors away. How many days had passed since I last saw Meghan? Oh right, just the one. I had left her to heal from the wounds my mother had inflicted upon her. I grimaced. My mother . . . Even thinking of the Morrigan in those terms turned my stomach. She was no more a mother to me than an oak tree was to one of its acorns. As soon as I was born, she cast me aside to fend for myself. That is until she realized I could be of some use to her. I had, after all, inherited my father's gift of battle fury, something that the Morrigan could use to her advantage. So she had returned for me in the end. And if it wasn't for my sister, I never would have succumbed to her wishes . . . Enough Cade. Those thoughts do you no good, I reminded myself as I rolled over, throwing my legs over the side of the bed in order to sit up. "Fergus?" I called out, my throat dry enough to make me choke. Once the coughing fit was over I remembered that Fergus wasn't with me. He was in the mortal world guarding Meghan. Taking a deep breath, I closed my eyes and drew on my magic. It hadn't completely returned to me after undergoing my riastrad, but enough of it was there to accomplish my next task. Fergus, I sent, the effort of reaching out to my spirit guide across the boundary between our worlds demanding my utmost attention. Yes, he responded. Meghan is well. Her injuries are healing and she will rest a few days more before returning to school. Only a small number of faelah linger on this side and I have been vigilant in my night hunts. None shall harm her. Thank you my friend, I sent back, breathing a sigh of relief and letting my magic return to where it resided next to my heart. Before I could take much comfort in Fergus's news, however, a wave of cold, evil glamour trickled over my skin. I clenched my teeth as the intrusive feeling left, hissing as the circular tattoo just above my heart burned like a poisonous brand. Almost involuntarily, my arm snaked out and I pressed my hand to my skin, trying to rub the ache away. It was no use. The tattoo had been placed with the Morrigan's magic. All of those she had enslaved bore the same mark and it was her way of keeping track of us as well as keeping us under control. If the tattoo started to hurt then she was getting impatient. I squinted through the darkness of my room and peered out the far window. Sunrise was probably an hour or two away, judging by the deep, inky blue of the sky. Guess I wasn't sleeping in this morning. Once I set my mind to answering the Morrigan's call, the pain abruptly vanished. I was tempted lie back down just to see if her magic would do anything to me, but I didn't really feel like playing games with my mother, not this soon after my expending my battle fury. It took me longer than usual to get dressed. Perhaps it had to do with my weakened state, but I think it had mostly to do with the fact that despite my misgivings, a part of me was always willing to irritate the Morrigan. Bracing myself, I took a deep breath and looked into the mirror hanging over my bathroom sink, the flicker of candle light banishing some of the early morning darkness. The mirrors of the Otherworld were clearer, somehow more revealing than those in the mortal world, and this one was no exception. It had been a gift from my sister, one of the few fine things I kept in this ruined castle I called home. That little detail would be changing soon, however. Someday I was going to bring Luathara back to its former glory, but right now I had the consequences of a broken geis to deal with. Sighing, I glanced once again at the figure staring back at me and winced. Oh yes, warping into one's battle fury sure did a number on one's appearance. The first thing I noticed were my eyes, their normal changeable green now a dull, pond-scum hue underlined by dark circles. My skin was pale and my face thin and drawn taught. I looked centuries older than I truly was. Not that age ever really showed on the Faelorehn, but then not all of us had the gift of transforming into a berserker warrior bent on using every last physical resource to do the most damage possible. Turning away, I shook those thoughts from my mind. I never considered myself a vain person, but there was a difference between vanity and being horrified at what a fierce fight could do to my appearance. Grabbing my heavy cloak, I blew out the candles and strode across the room. I didn't bother making my bed or closing the door behind me. No one ever came here, except for me, and if I delayed the war goddess any longer she might drive that painful magic deeper than the surface of my skin. The morning greeted me with thick fog, wisps of it shredding away from the treetops and raining down in streamers of damp gray. I guess it had taken me longer than I thought to get ready, because I could tell from the dim light that the sun had begun to rise somewhere in the east. Bracing myself, I descended the stone steps and headed toward the opposite end of the courtyard. About halfway to my destination a low, demanding cackle split the air, forcing my heart up into my throat. I spun around, my eyes darting around the crumbling courtyard walls. I expected to find a large black raven watching me from somewhere, so when my eyes fell upon a huge white bird a slight prick of surprise stabbed at me. The bird tilted its head and regarded me with one eye, the eye that hadn't been damaged in some battle long ago. It gave another one of those blood-chilling caws and then ruffled its feathers and shook, waiting for my next move. "Tell your mistress I'm on my way," I growled as my hands balled into fists. The white raven gave another croak before flapping its wings and disappearing into the mist. As it headed east, I could have sworn it was laughing at me. Speirling was waiting for me in the field, his dark ears pricked forward as he sensed my approach. Letting out a deep whinny, he tossed his head and dug at the damp earth. My misgivings melted away as my mouth curved into a smile. As my fingers found Speirling's velvet nose, I was further comforted by his positive thoughts. "You're always looking on the bright side, aren't you?" I murmured, pressing my forehead to his. I didn't bother saddling him, since I was running late already and since I didn't really need a saddle. A swift pace and five dolmarehn crossings later, Speirling and I found ourselves at the foot of the eastern mountains and on the threshold of the Morrigan's underground fortress. Taking a deep breath that coated my lungs with ice, I slid from Speirling's back and ordered him to take refuge where he could. No horse should ever have to cross into the Morrigan's territory, let alone follow me down the haunted crevasse that waited several yards ahead. Wrapping my wool-lined cloak tightly around me, I took the first step down a path that would surely lead to pain. Every instinct I possessed, and believe me, I possessed more than the average Faelorehn, bit and clawed and chewed at me to turn around and flee. I could have, in fact I would have been smart to turn and forget the Morrigan and her evil demands. My geis was broken and she had decided not to kill me, not yet at least. But if I disobeyed her now, the first thing she'd do wouldn't involve coming after me. No, she'd aim straight for Meghan and kill her, or worse. Calling on my glamour to help fight my anxiety, I trudged on, kicking aside broken skulls and fighting the shivering chill that coursed through me. Forever, it seemed, I walked, the walls growing steeper, the skeletons and mummified flesh of long dead animals becoming more frequent. Fortunately the air was so cold it kept most of the stench at bay, but every so often a small breeze would stir up the scent of death and rot and I'd have to pause and swallow several times in order to keep from getting sick. Finally, after what felt like hours, I reached the end of the narrow valley. A great stone doorway complete with a skull-studded border, loomed before me. On the branches of two dead, bleached oak trees perched three or four dozen ravens, all hunkered down against the cold, their stark blackness contrasting greatly against their bleak white and pale gray surroundings. Not one of them uttered a sound or ruffled a feather. Then, just as I reached up to touch the ogham letters adorning the stone doorway, one of the ravens let out a grumbling caw, setting all the others off. I shot a glance upward, narrowing my gaze at the raven I hadn't seen before. He was so pale that he'd blended in with the ashy rock behind him. "Alahníl," I said, remembering the name of my mother's spirit guide. Just then a deep rumbling sound rolled up from the earth and the door cracked open, exhaling a frozen breath of fear and death. I got my panic and the overwhelming urge to shiver under control before I looked back up at the white raven. "I take it you told the Morrigan of my arrival," I stated more than asked. All I got in return was a self-satisfied grumble. Forgetting the birds, I turned and faced the yawning darkness before me. I had no idea how long the tunnel was, or if there was a tunnel at all. Like many of the caves found in Eile, this one was a dolmarehn. But instead of leading to another part of Eile or even to the mortal world or some other realm beyond our own, this one led directly into the Morrigan's cavern. Taking a deep breath, I closed my eyes and stepped into the darkness, wondering if I was making the right choice and wondering what horrible, unconscionable thing my mother would have me do for her next. Wow I can't wait for the whole book!